We miss you! Thank you for your visions!!! He has been a great influence on me since my childhood. Blueberry was my father’s favourite comic and we has a lot of his works in our library. I liked his organic, weirder works more and they are so powerful, especially when you encounter them as a child. if the afterlife is just that we have to live in our imagination, i’m coming to visit once I’m done here. He truly was a man of boundless imagination. A sad day for the world of comics and beyond. This is very sad, though all great things pass. I believe his work is embedded in at least my creative heart, and likewise in the hearts of millions, and in at least this way his spirit will continue accomplishing. He was one of my first influences, as my father used to give me Heavy Metal magazine to read as a child, paper clips in theory keeping me out of the more disturbing sections (always just the violent ones, never any others, and never Moebius’ work) I grew up on the Incal, and john difool was always one of my heroes, i was sad that there were no action figures of him. I have recently been reading books by Jodorowsky, his often collaborator, which makes this all the more timely. The greatest gift we can give to an artist is to fully receive their work, snd once internalized, it will come out again like a phoenix, in both our lives and our own art. 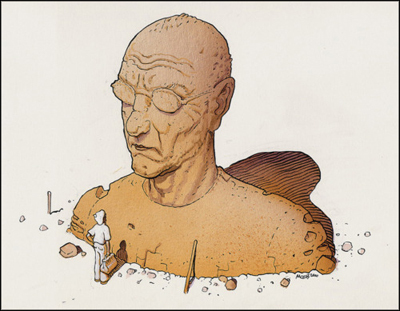 Moebius, Jean Giraud, you have given us material truly worthy of being received and reborn, you have given us depth and humour, usually all at once, and of course, infinite beauty. You will be missed, but more importantly, you have been received. Thank you for sharing your vision with us.